Flickr is restricting its free plan to just 1000 photos so we’ve put together a guide to help you download your photos and videos from Flickr and/or migrate from Flickr to other services. Everything you need is all available in PicBackMan. Flickr is changing. What you need to know. SmugMug acquired Flickr earlier in 2018. SmugMug sent an update to all Flickr users on Nov 6, 2018 outlining several big changes. The biggest change is that they are taking away the free storage that was available to all Flickr free users & are capping the free account storage to JUST 1000 photos. If you have more than 1000 photos, then you have to either upgrade to the Flickr Pro account or download your photos. On Nov 6, 2018 SmugMug send an email to all Flickr users announcing a big change to the free plan limit & a new pricing for the pro plan, along with dates when changes will go into effect. From Tuesday, January 8, 2019 free users over the 1,000-photo limit will be unable to upload new photos to their Flickr accounts. From Tuesday, February 5, 2019 Flickr will start deleting photos (oldest to newest) for free users over the 1,000-photo limit. Deletions continue until your account reaches the 1,000 photos limit. PicBackMan is the fastest & most reliable way to migrate your photos from Flickr to another service, gets the jobs done effortlessly & saves you 100s of hours of cumbersome effort. Maintain album structure. Replicate actual album structure while migration. Privacy. All Dropbox migration are marked PRIVATE. Comprehensive migration. 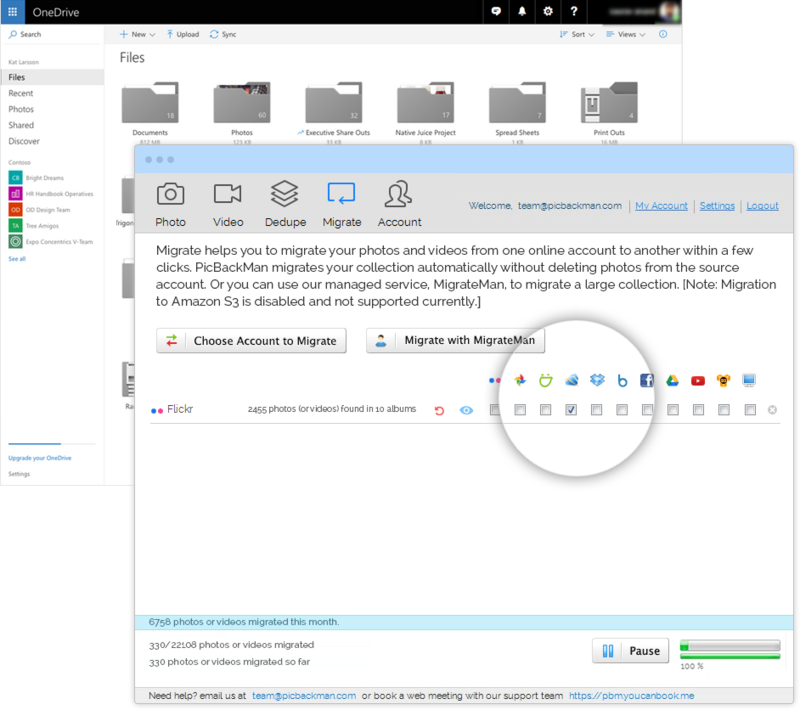 Migrate entire SmugMug collection to Dropbox. Compress free. 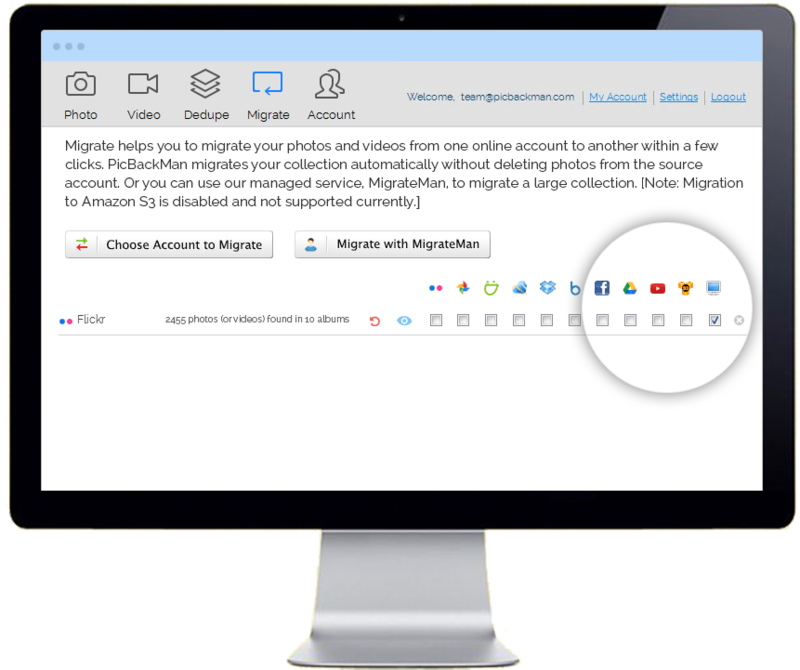 Migrate photos & videos with actual size. Live reporting. Experience actual migration count of files. Automatic error handling. 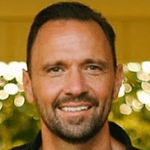 Migration error will be handled automatically. Google Photos provides unlimited storage (in reduced size format) for your photos and is a great option to transfer your photos from Flickr. PicBackMan has built-in support for Flickr to Google Photos migration and you can gets started with a free account and upgrade as needed. 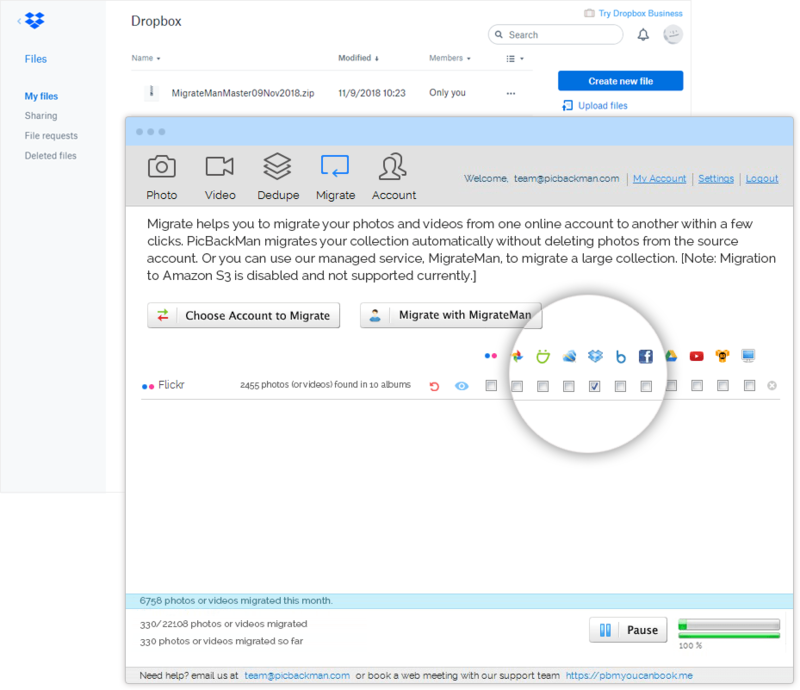 Dropbox has been a cloud storage of choice for millions of users globally and PicBackMan’s Flickr to Dropbox migration is seamless and ensure full mirroring of your Flickr albums as folders in your Dropbox account. Dropbox has free storage upto a certain limit beyond which you can buy extra storage at a optimized cost. Transferring your photos from Flickr to Box is another great option. Box is a public company and a reliable provider of online store that you an use to migrate your Flickr albums to. Start with the Box free account and upgrade based on your storage needs. If you’d like to have a stellar viewing experience for your photos in addition to safe online storage, then SmugMug is a great choice. It is a paid service but one that is trusted by millions users for 15+ yrs. 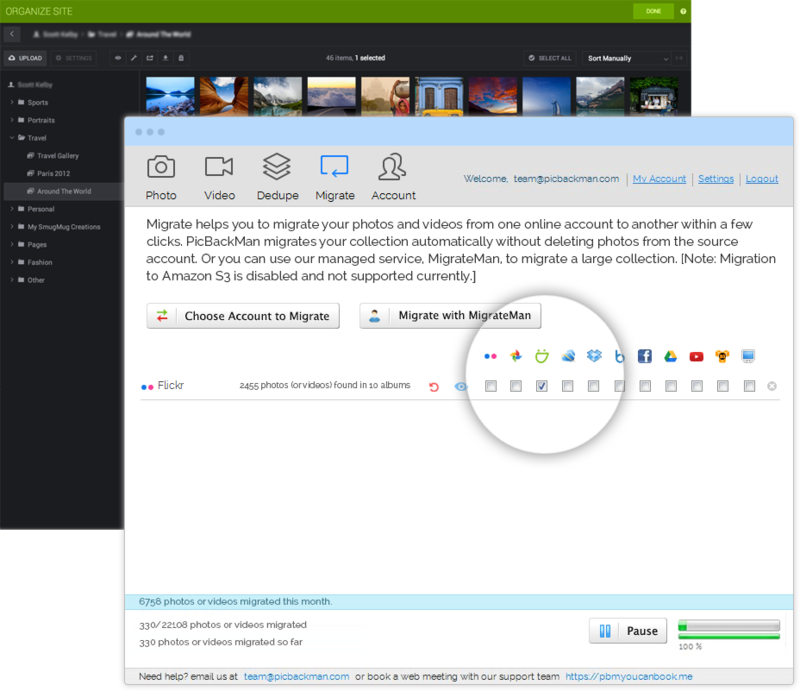 Use PicBackMan’s Flickr to SmugMug migration to effortlessly transfer photos from your Flickr account. 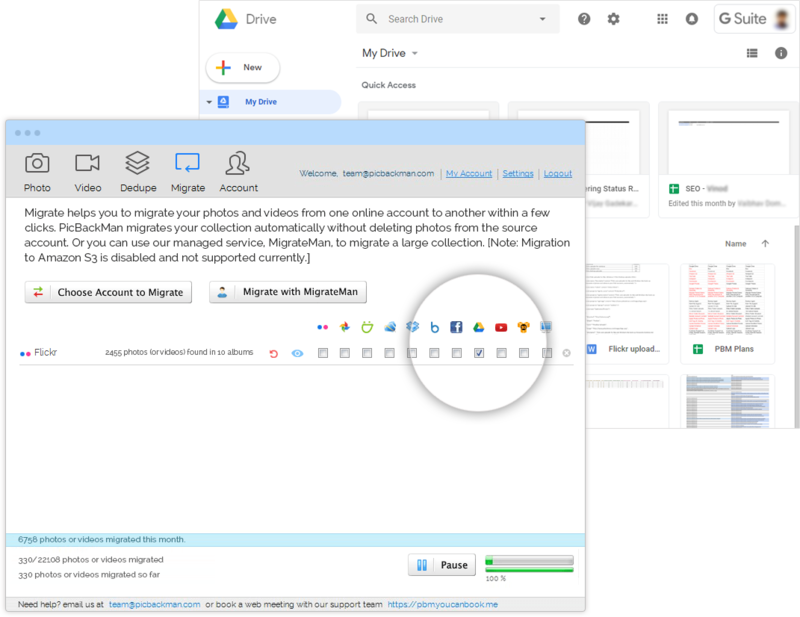 If you are already using Google Drive for your cloud storage, then you can use PicBackMan’s Flickr to Google Drive migration support to comprehensively transfer all your Flickr albums to Google Drive and save 100s of hours in doing so. 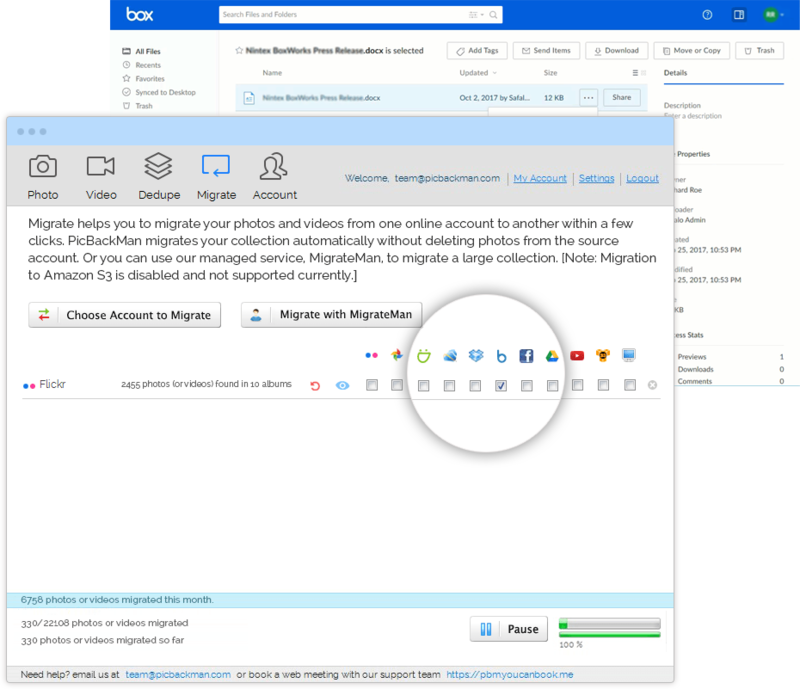 PicBackMan has full support for Flickr to OneDrive migration wherein you can move your full collection of photos from Flickr to OneDrive and retain your exact album structure. Another option you have is to simply download the entire collection from your Flickr account to your computer and decide which service to use at a later point. To do this, use PicBackMan migration app and choose the “computer” option. We’ve outlined all the common questions about transferring or downloading your photos from Flickr. We are constantly updating this too. If you have a question, that is not covered here, please email us at team@picbackman.com. Flickr was acquired by SmugMug earlier in 2018 and is now a service offering of SmugMug, the photo storage service that is been around from 15+ yrs and is a trusted provider for millions of users. What changes did SmugMug announce for Flickr? SmugMug (Flickr’s new parent company) sent an update to all Flickr users on Nov 6, 2018 outlining several drastic changes. The biggest change is that they are taking away the free storage that was available to all Flickr free users and are capping the free account storage to JUST 1000 photos. If you have more than 1000 photos, then you have to either upgrade to the Flickr Pro account or download your photos & migrate to another service. Until when do I have to decide about upgrade or download? After Feb 5, 2019, SmugMug said that it will start deleting the Flickr free account photos from oldest to the newest until the 1000 photos limit is reached. Where can I migrate my Flickr photos to? 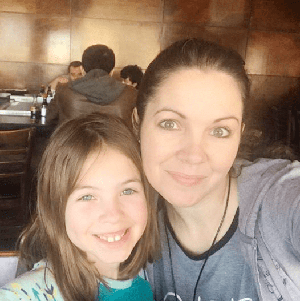 There are several online services that you can choose from including Google Photos (free & unlimited storage), Dropbox, Box, SmugMug, Google Drive and OneDrive amongst others. These are most commonly used services to store photos and videos. How do I migrate photos from Flickr? How do I download all my photos from Flickr? PicBackMan comes with a built-in feature for bulk downloading your Flickr photos to your computer too. 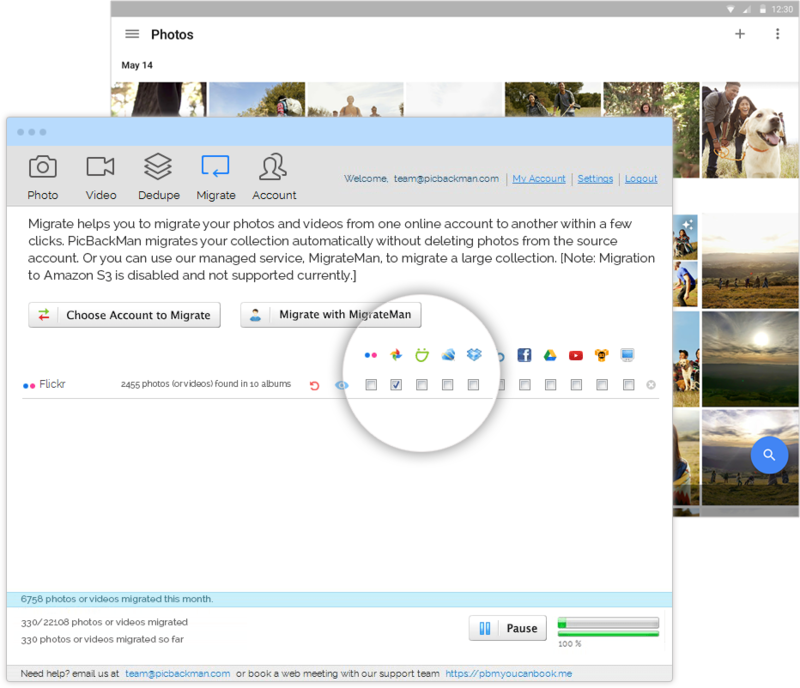 Simply hit the Migrate tab, and choose the computer icon to download your entire Flickr collection to your computer - automatically and effortlessly.